school life. Below are some notes related to the theme. Mar shampla, seomraí ranga, cistin, seomra ceoil, seomra ealaíne, seomra ríomhaireachta, seomra teicneolaíochta, seomra adhmadóireachta, seomra líníochta, seomra miotalóireachta. Tá trí shaotharlann eolaíochta againn. For example, classrooms, a kitchen, music room, art room, computer room, technology room, woodwork room, graphics room, metalwork room. We have three science labs. Tá leabharlann sa scoil agus tá timpeall fiche riomhaire ann, chomh maith leis an seomra ríomhaireachta. There is a library in the school and there are around twenty computers in it, as well as the computer room. Tá ceantaín na scoile suite in aice leis an tionól agus bíonn bia te ar fáil ann gach lá. The school canteen is situated beside the assembly and there is hot food available every day. Bíonn sé ar oscailt sa sos agus ag am lóin gach lá agus bíonn club bricfeásta ann gach maidin ó 8.30 go dtí 9 a chloig. Ithim mo lón ann ó am go ham nó faigheann tae nó anraith ann ar maidin. It is open at break and at lunchtime and there is a breakfast club every morning from 8.30 – 9.00. I eat my lunch there from time to time or I get tea or soup there in the morning. Tá a lán ábhair ar fáil sa scoil seo, idir na hábhair phraiticiúla, na teangacha agus a lán ábhair eile. There are many subjects available in this school, between practical subjects, the languages and many other languages. 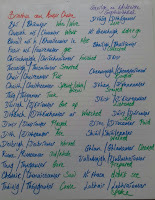 Déanaim fein gaeilge, béarla etc… I do Irish, English etc. Ní maith liom an éide scoile mar ta sé beagán leamh ach is dócha gur smaoineamh maith é I don’t like the uniform because it’s a bit dull but I suppose it’s a good idea. Ní bhíonn comórtas faisin idir na daltaí There isn’t a fashion competition between the pupils. Má bhrisenn tú na rialacha bíonn tú i dtrioblóid leis an múinteoir. Faigheann tú obair bhreise nó scriobhann an múinteoir nóta i do dhialann. Uaireanta bíonn daltaí ar choimeád ag am lóin nó bíonn said i dtrioblóid leis an gceannaire bliana. If you break the rules you get in trouble with the teacher. You get extra work or the teacher writes a note in your journal. Sometimes students are on detention at lunchtime or they get in trouble with the Year Head. 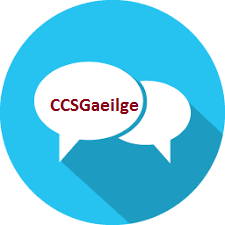 Click here for downloadable answer: Céard a dhéanfaidh tú tar éis na hardteiste?